Weebly Pricing - Starter, Pro, or Business? Weebly Pricing – Starter, Business, or Pro? Having Trouble Finding Weebly Prices? If you browse Weebly’s website, it can be a little difficult to find information on the different versions and features. And that’s because Weebly’s marketing strategy is to get people to sign up for a free account which has everything you need to build a website fast and easy. After you signup and start using the Weebly website builder, then they begin to show you the benefits of upgrading to a paid Weebly plan, which I talk about below. Since it can be a little difficult to find the features and pricing of Weebly’s upgraded accounts until you become a free member, I’ll give you a sneak peek here of Weebly pricing and features included with the different plan levels Starter, Pro, and Business. I paid for Weebly PRO on my example site so I could write a complete review of Weebly. Starter ranges from $3/mo paying for 2 years to $5/mo paying for 6 months. Pro ranges from $7/mo paying 2 yrs to $10/mo paying for 6 months. Business ranges from $20/mo paying for 2 years to $29/mo for month-to-month. Prices shown are for new accounts as of April, 2016. If you see lower prices in your account, it may be that you were grandfathered into lower prices. 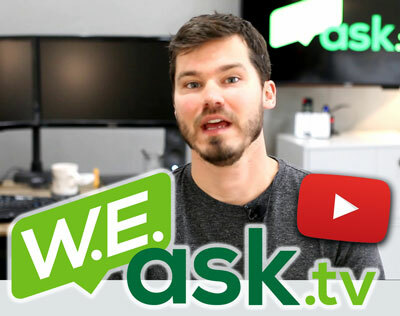 How Many Sites Do You Get With An Upgraded Weebly Account? As of August 2013, you have to upgrade each site individually. You no longer get 10 sites with each upgrade the way you did prior to August 2013. If you upgraded before August 2013, you may be “grandfathered” into the old pricing program as I was. Lucky me! Even though the Weebly free version has a ton of features, you may be sacrificing professionalism by using it. In the past, I recommended Weebly PRO because of the ability to customize the footer and easily get rid of the “Get a FREE Weebly Site” text in the footer. Now that feature is included with the Starter version. For less than $5/month, you can upgrade to Starter and customize your footer to display what you want. Plus you’ll get a few other features like premium support and expanded web stats. Check out the custom footer I was able to create below. You can customize it in many ways but my footer is just text and a picture. The ability to use your own domain is limited to paid versions of Weebly. 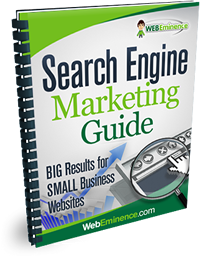 So with a free account you will only be able to use a subdomain like webeminence.weebly.com for your website. The domain name is the most important asset of your website so having your own is very important if you want to build the popularity and value of your domain over the long term. This is probably the #1 reason most people should upgrade at least to the Starter plan. 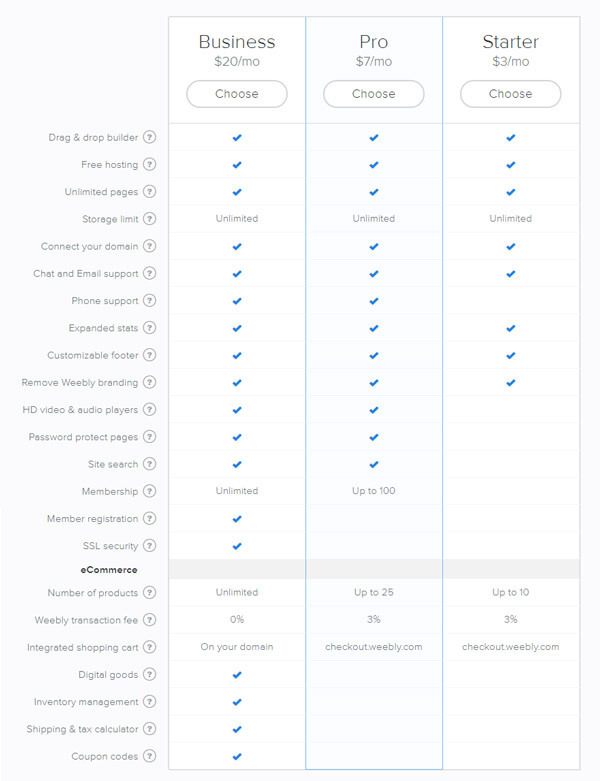 You can see from the comparison chart above what you will get beyond the Starter version if you upgrade to Weebly PRO. There may be specific reasons why you may need to upgrade to PRO like needing more storage or password protection. But I think the coolest feature with PRO and the #1 reason to upgrade is the Header Slideshows. With the free version of Weebly, you can add static pictures and text to the header area, but with the PRO version, you can add dynamic header slideshows that change on their own to create movement on your site. Adding this kind of movement to your site is a great way to capture the attention of your visitors and keep them on your site longer. This feature by itself is worth the price of Weebly PRO in my opinion because it will increase the effectiveness of your site. Here’s an example of what the Weebly PRO header slideshows look like, but it can be customized many ways. Click the image below to view it live on my Weebly Site. If you are already a free member of Weebly, you can login and click upgrade to see the PRO features. Here are some of the important ones. Some of these are also available in the Starter version (see the chart above). Remove Weebly Footer and customize your own footer. See mine on my example site. 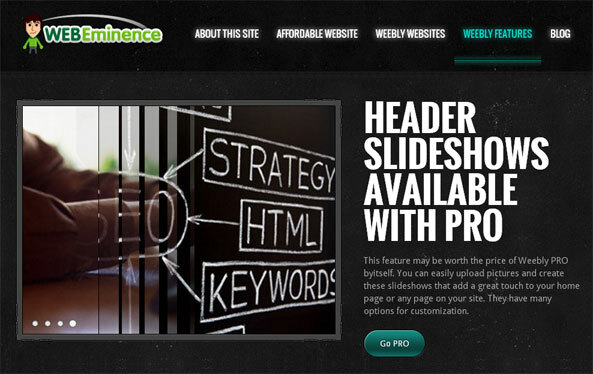 Header Slideshows – adds a professional touch to your site. See my header slideshows. In 2014 Weebly released new and improved e-commerce features called Weebly eCommerce. I published another post on it including costs and a video walkthrough. The eCommerce features of Weebly are available to any Weebly upgraded website at the Starter level or higher but there are limitations as you can see on the chart above. Mainly, sellers on the Starter and Pro plans will be limited on the number of products they can sell. Weebly created the new Business level plan to offer higher level e-commerce features like unlimited products, no transaction fee, inventory management, coupon codes, and more. It’s a great option for sellers with high sales volume or who want to create a more professional online store.